England and Wales (Welsh: Lloegr a Chymru) is a legal jurisdiction covering England and Wales, two of the four nations of the United Kingdom. "England and Wales" forms the constitutional successor to the former Kingdom of England and follows a single legal system, known as English law. The devolved National Assembly for Wales (Welsh: Cynulliad Cenedlaethol Cymru) was created in 1999 by the Parliament of the United Kingdom under the Government of Wales Act 1998 and provides a degree of self-government in Wales. The powers of the Assembly were expanded by the Government of Wales Act 2006, which allows it to pass its own laws, and the Act also formally separated the Welsh Government from the Assembly. There is no equivalent body for England, which is directly governed by the Parliament and the government of the United Kingdom. During the Roman occupation of Britain, the area of present-day England and Wales was administered as a single unit, with the exception of the land to the north of Hadrian's Wall – though the Roman-occupied area varied in extent, and for a time extended to the Antonine/Severan Wall. At that time, most of the native inhabitants of Roman Britain spoke Brythonic languages, and were all regarded as Britons, divided into numerous tribes. 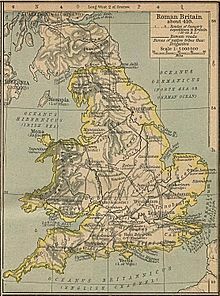 After the conquest, the Romans administered this region as a single unit, the province of Britain. Long after the departure of the Romans, the Britons in what became Wales developed their own system of law, first codified by Hywel Dda (Hywel the Good; reigned 942–950) when he was king of most of present-day Wales; in England Anglo-Saxon law was initially codified by Alfred the Great in his Legal Code, c. 893. However, after the Norman invasion of Wales in the 11th century, English law came to apply in the parts of Wales conquered by the Normans (the Welsh Marches). In 1283, the English, led by Edward I, with the biggest army brought together in England since the 11th century, conquered the remainder of Wales, then organised as the Principality of Wales. This was then united with the English crown by the Statute of Rhuddlan of 1284. This aimed to replace Welsh criminal law with English law. Welsh law continued to be used for civil cases until the annexation of Wales to England in the 16th century. The Laws in Wales Acts 1535–1542 then consolidated the administration of all the Welsh territories and incorporated them fully into the legal system of the Kingdom of England. Prior to 1746 it was not clear whether a reference to "England" in legislation included Wales, and so in 1746 Parliament passed the Wales and Berwick Act. This specified that in all prior and future laws, references to "England" would by default include Wales (and Berwick). The Wales and Berwick Act was repealed in 1967, although the statutory definition of "England" created by that Act still applies for laws passed before 1967. In new legislation since 1967, what was referred to as "England" is now "England and Wales", while references to "England" and "Wales" refer to those political divisions. England and Wales are treated as a single unit for some purposes, because the two form the constitutional successor to the former Kingdom of England. The continuance of Scots law was guaranteed under the 1706 Treaty of Union that led to the Acts of Union 1707, and as a consequence English law—and after 1801, Irish law—continued to be separate. Following the two Acts of Union, Parliament can restrict the effect of its laws to part of the realm, and generally the effect of laws, where restricted, was originally applied to one or more of the former kingdoms. [clarification needed] Thus, most laws applicable to England also applied to Wales. However, Parliament now passes laws applicable to Wales and not to England (and vice versa), a practice which was rare before the middle of the 20th century. Examples are the Welsh Language Acts 1967 and 1993 and the Government of Wales Act 1998. Measures and Acts of the National Assembly for Wales passed since the Government of Wales Act 2006 apply in Wales but not in England. Following the Government of Wales Act, effective since May 2007, the National Assembly for Wales can legislate on matters devolved to it. Following a referendum on 3 March 2011, the Welsh Assembly gained direct law-making powers, without the need to consult Westminster. This was the first time in almost 500 years that Wales had its own powers to legislate. Each piece of Welsh legislation is known as an Act of the Assembly. For a company to be incorporated in the United Kingdom, its application for registration with Companies House must state "whether the company's registered office is to be situated in England and Wales (or in Wales), in Scotland or in Northern Ireland", which will determine the law applicable to that business entity. A registered office must be specified as "in Wales" if the company wishes to use a name ending cyfyngedig or cyf, rather than Limited or Ltd. or to avail itself of certain other privileges relating to the official use of the Welsh language. Outside the legal system, the position is mixed. Some organisations combine as "England and Wales", others are separate. In sports, cricket has a combined international team administered by the England and Wales Cricket Board, who also govern the sport across both nations, whilst football, rugby union, rugby league, the Commonwealth Games and other sports have separate national representative teams for each country. A few Welsh association football clubs, most notably Cardiff City F.C. and Swansea City F.C., play in the English football league system, while The New Saints F.C., which represents places on both sides of the border, plays in the Welsh football league system. Some religious denominations organise on the basis of England and Wales, most notably the Roman Catholic Church, but also small denominations, e.g. the Evangelical Presbyterian Church. Prior to the disestablishment of the Church in Wales in 1920, the Anglican church in Britain operated under the jurisdiction of the Church of England throughout Wales and England. The Electoral Commission maintains a register of political parties, organised according to where the party operates (either England, Wales or England and Wales). Some professional bodies represent England and Wales, for example the Institute of Chartered Accountants in England and Wales, the General Council of the Bar, the Law Society, the National Farmers Union and the Police Federation of England and Wales. Other examples include the Canal & River Trust, the Charity Commission, the General Register Office for England and Wales, Her Majesty's Inspectorate of Constabulary, HM Land Registry, Her Majesty's Prison Service, Mountain Rescue England and Wales, the Worshipful Company of Chartered Accountants and the Youth Hostels Association. The order of precedence in England and Wales is distinct from those of Northern Ireland and Scotland, and from Commonwealth realms. The national parks of England and Wales have a distinctive legislative framework and history. ^ Cannon, John (2009). A Dictionary of British History. Oxford University Press. p. 661. ISBN 0-19-955037-9. Retrieved 15 October 2010.